Make these cool and creamy Layered Margarita Bites. Requiring just four ingredients, these Layered Margarita Bites are like tiny works of art! Add boiling water to gelatin mixes in large bowl; stir with whisk 2 min. until completely dissolved. Stir in tequila and 2 Tbsp. lime juice. Add COOL WHIP and 1 tsp. lime zest; stir until COOL WHIP is completely melted and mixture is well blended. Pour into 8-inch square pan. Refrigerate 3 hours or until firm. Cut into 36 pieces to serve. 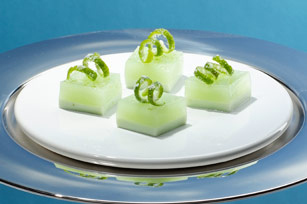 Prepare using JELL-O Lemon Flavor Gelatin. Treat yourself on occasion to bite-size tastes of indulgent foods..
Makes 9 servings, 4 pieces each.